This taco casserole recipe is based on a post on the Mothering message board from March 2007. The topic of discussion was cheap meals. I actually found the thread even after all this time and there are lots of good ideas. I’ve adapted the recipe a bit. Preheat oven to 350 F. Grease an 8″ x 8″ casserole dish. Dump all ingredients except cheese into dish and stir well. Sprinkle top with cheese. Bake 25-30 minutes. You can serve it with chips, salsa, sour cream, jalapenos, etc if you like. People have been eating macaroni and cheese for a long time. It first appeared in a modern cookbook in 1769. There are tons of recipes for this dish and people can have very strong feelings. Growing up we never had boxed macaroni and cheese at my house. My mom added cubes of Velvetta cheese, milk and pepper to cooked macaroni. (I would steal cubes of cheese.) When I got older I started to dislike the taste of Velvetta cheese product so had to find a recipe for this classic comfort food that I could enjoy. From the 1946 Fannie Farmer’s Boston Cooking School cookbook via http://www.food.com/recipe/fannie-farmers-classic-baked-macaroni-cheese-135350 comes my favorite mac and cheese. I use just 2 c of regular milk instead of milk and cream and add 1/2 tsp onion powder and 1/4 tsp dry ground mustard. Preheat oven to 400°F .Cook and drain macaroni according to package directions; set aside. In a pan melt butter over medium heat.Add flour mixed with salt, pepper, onion powder and mustard powder. Whisk until well blended. Pour milk in gradually while stirring. Bring to boiling and cook until thickened stirring constantly about10 minutes. Add shredded cheddar little by little and cook until cheese melts. 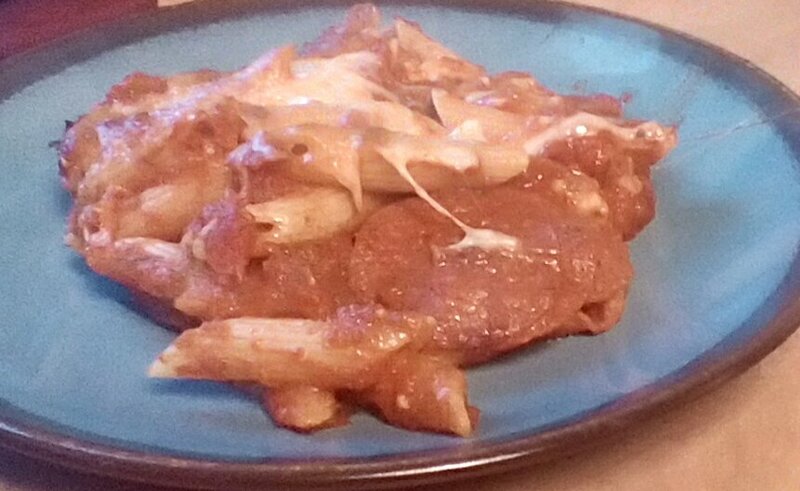 Stir sauce and macaroni together and put in 8″ baking dish. Sprinkle top with buttered crumbs. Bake 20 minutes until the top is golden brown. 4-5 servings. I found this old recipe the other day for spaghetti olivetti. I remember it was one of the first things I cooked for Hagbard before we got married 16 years ago. We haven’t had it for years so I decided to make it and see if we still liked it. I don’t know where I originally got the recipe but I found it on Food.com when I searched for it. http://www.food.com/recipe/baked-spaghetti-olivetti-63612 I made a few changes like reducing the cheese and skipping the oil and salt in the pasta water. Cook the spaghetti about 1/2 the time the package calls for. Drain. Mix with sauce. Mix cheeses and parsley together. 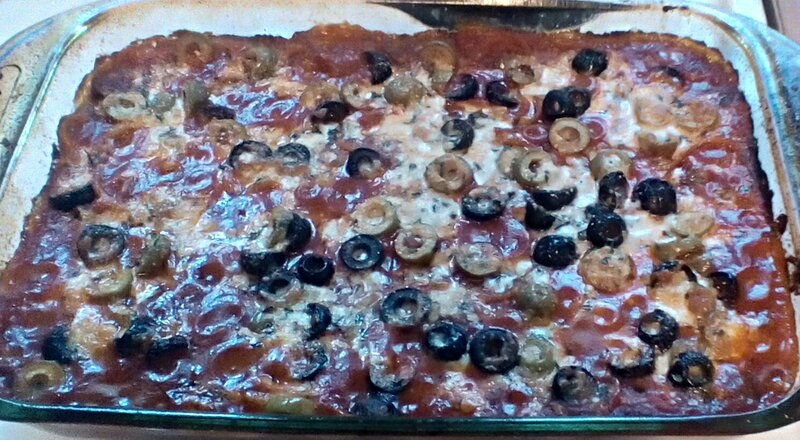 In a greased baking dish layer 1/2 of spaghetti, 1/2 of cheese and 1/2 of olives. Layer the rest of spaghetti, olives and cheese. Bake 25-30 minutes. Lounmoun- I think it was pretty good but in future I would probably just mix the olives with the spaghetti and sauce and just put all of the cheese on top instead of trying to do layers. Everything got separated and mixed up when served anyway. This was not the chicken biscuit recipe I had originally planned to make this month. The one I had planned to make had cheese and sour cream with chicken and vegetables. When I went to find my recipe it was missing. I found similar recipes online but they used things like canned soup and mayonnaise and I didn’t really want to use that stuff. So I found this chicken pot pie recipe on allrecipes.com that didn’t used canned ingredients except for canned biscuits. I made a few small changes. I used regular whole milk instead of half and half cream and I added 1/4 tsp garlic powder. I left out 1/2 cup of the chicken and two biscuits for Amethesto because she didn’t want to try this mixture. Verdict: It was not hard to make and was very tasty and filling. Hagbard had two servings but I was full with one. I wanted to eat more though!